I went up to Amy's yesterday and went just a tad crazy in the Down Sunshine Lane room. 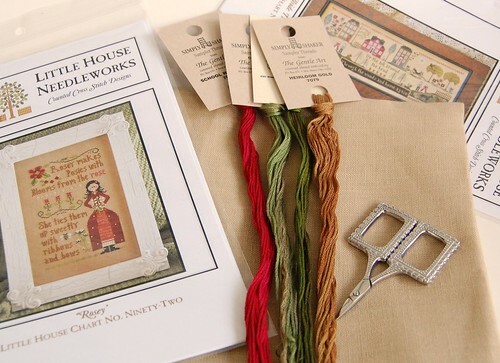 The Sampler Company "Hetty Child, "40 ct. 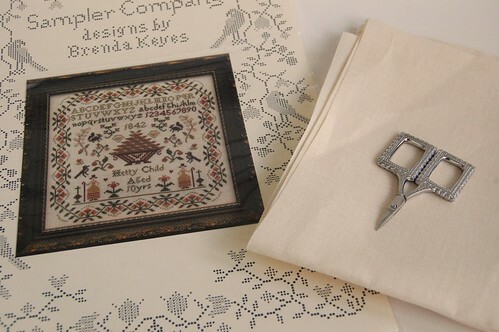 Antique White linen and Kelmscott's Lace Scissors. 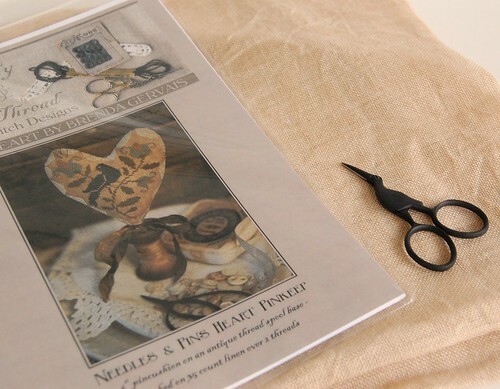 With thy Needle and Thread "Needles and Pins Heart Pinkeep," 30 ct. Iced Cappuccino R&R and Kelmscott's Primitive Storkette Scissors. Close up of both scissors - I'm such a sucker for pretty scissors! New LHN designs "Rosey" and "Hillside Travelers" with 40 ct. Summer Khaki linen. 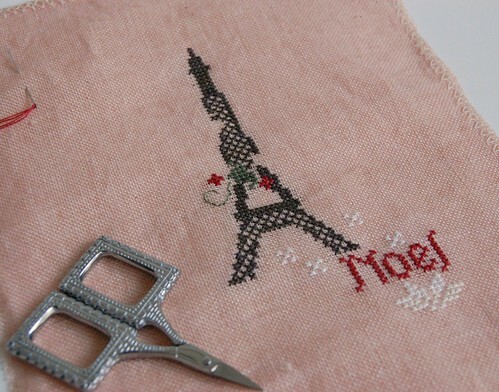 I also got a good portion of my "Souvenir of Paris" stocking done. I hope to finish it up today!! 30 ct. St. Valentine's Blend by R&R, Recommended threads (2 over 2). Anyho, have a great stitch'n day! Wow, you bought some gorgeous stash there, I'm green with envy lol! Lovely progress on your stocking as well. Wow, fantastic!! Looks like you had a fun time, with all that new stash! Great new stash you have, Nicole! You are too funny! Love your new stash too! Nice stash! It's hard to resist the stashing, isn't it? WOW hun; that's a great stash haul you had. :) Makes me want to go to my LNS!! Wow that's a lot of fun stash!!! Super fun stash!! I soo wish for a LNS. 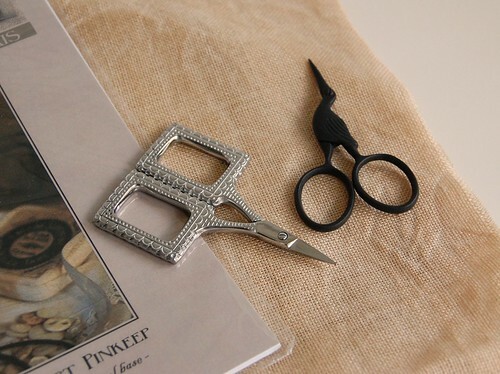 I have the lace scissors and they are just soo pretty...love em! Fabulous stash! 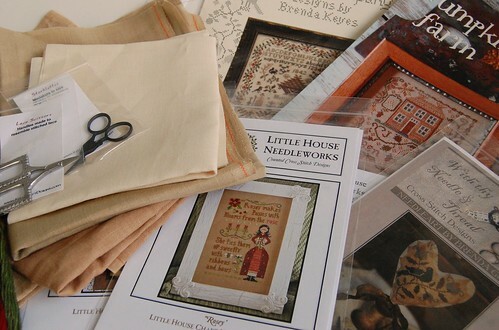 I love those little lace scissors - so cute!! Your stocking will be done in no time. Don't you love that St. Valentine's Blend - just a subtle hint of pink! What fantastic stash - enjoy! Wow...GREAT stash!! I think "Souvenir from Paris" is so cool!